Birch, K. and Muniesa, F. (eds) (under contract) Turning Things into Assets, Cambridge MA: MIT Press. 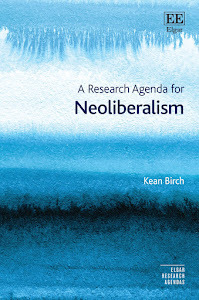 Birch, K. (forthcoming) Struggling with neoliberalism: A response to Richard Peet’s review of 'A Research Agenda for Neoliberalism', Human Geography. Birch, K. (2019) Neoliberal Bio-economies? The Co-construction of Markets and Natures, London: Palgrave Macmillan. Birch, K. (2018) Review essay: What is the asset condition?, European Journal of Sociology 59(3): 500-506. Chiappetta, M. and Birch, K. (2018) The limits to biocapital, in S. Hilgartner, S. Gibbon, B. Prainsack and J. Lamoreaux (eds), The Handbook of Genomics, Health and Society, London: Routledge. Birch, K., Tyfield, D. and Chiapetta, M. (2018) From neoliberalizing research to researching neoliberalism: STS, rentiership and the emergence of commons 2.0, in D. Cahill, M. Konings, M. Cooper and D. Primrose (eds), The SAGE Handbook of Neoliberalism, London: SAGE. Birch, K. (2017) A Research Agenda for Neoliberalism, Cheltenham: Edward Elgar. Birch, K., Peacock, M., Wellen, R., Hossein, C., Scott, S. and Salazar, A. (2017) Business and Society: A Critical Introduction, London: Zed Books.